Living in a big city is convenient, but it comes with a cost: we (kids and adults included) don’t get to connect with nature very often. And that’s a shame, because nature is all sorts of wonderful. Fortunately, nowadays you can hop to an iPad and be transported into a forest, a mountain, a beach. 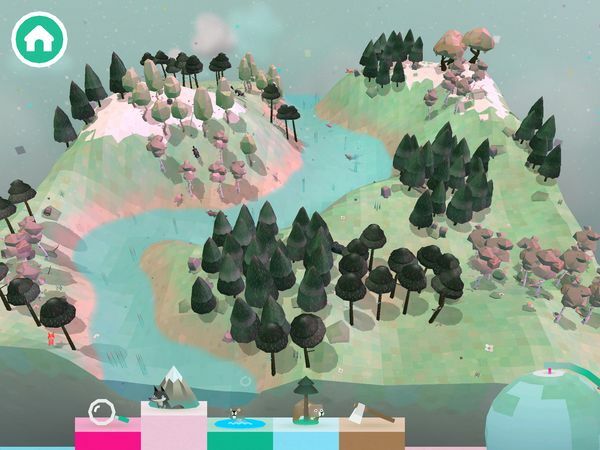 Or even better, you can shape your own landscape just like in Toca Boca’s newest app, Toca Nature. It’s an imaginative app that aims to convey the wonders of nature by putting the forest in kids’ hands — and it works, we can tell you that. At the beginning of the app, you will see a piece of land floating in space. You can spin the world using the globe control on the lower right corner. There are also several tools on the bottom that you can use to sculpt the landscape to your liking. The tools are, from left to right, the magnifying glass, the mountain tool, the water tool, the tree tool, and the axe. All tools are used by first selecting the one you want, and then dragging your finger across the terrain. Using the mountain tool, for example, you can smudge on an area to raise the ground. Raise it high enough, and snow will appear on top. On the contrary, the water tool digs into the ground, which eventually creates water-filled holes. The tree tool is used to plant trees. There are five types of trees: pine, birch, spruce, alder, and oak. To select a specific type of tree, tap on the tree tool once. To cut down trees, use the axe tool. The magnifying glass is used to zoom in on any location you’ve created. When you find yourself in the middle of your forest, you can navigate by dragging on the screen and use the globe to turn around. As you build your world, you may notice that animals will start to appear. There are several animals available: wolf, beaver, bear, hare, fox, woodpecker, deer, and fish. Each animal is tied to a specific nature type; for example, wolves are only found on snowy mountains and foxes in forest of oaks. Zooming in on your world, you can also learn that each animal enjoys different types of food. The food are grown in different environments, and can be picked by up tapping on them. When you feed an animal the food they want, they can grow bigger. A neat feature is the in-app camera, which lets you take pictures in the zoomed-in view. Simply pan the screen to frame the scene, then tap on the crosshair to snap a picture. The resulting photos are automatically saved to your device’s camera roll. Parents need to know that Toca Nature is designed to simulate nature, but it does so in a child-friendly fashion. The animals don’t prey on each other, save for the carnivores that will gobble up the fish you feed them. There is no death either, although you will find a scattering of bones where carnivorous animals live. Observing the different habitats in the app, you can discuss with your kids how the elements in nature connect and interact with each other. Problem solving skills may be required to some degree to figure out how specific environmental conditions can affect the animals that live there. For example, if you create a forest on a snowy mountain, the animals that live there may have have a different appearance. But because the conditions are harsh, they are rare and will only appear in bigger forests. See if you can make the white fox, the white bear, and the white hare appear! As with all other Toca Boca apps, Toca Nature presents a rule-free gameplay where kids decide how their world will look like. Their work will be automatically saved, although please keep in mind that the world will be reset if you close the app completely from the multitasking bar. Toca Nature does not contain in-app purchases and third-party apps. Links to the protected For Parents section as well as Toca News can be disabled from the Settings panel of your device. It’s another home run from Toca Boca! Toca Nature is truly a joy to play. The app is intuitive and responsive; I love how the landscape rumbles and transforms instantly as you run your finger across the screen. The graphics are vibrant and as always, full of details. It’s always a pleasure to zoom in on your newly made world to discover various little things, like the way the shadows move as the day passes, the constant sound of birdcalls, and strange rocks bearing strange glyphs. And oh, we love, love, love the soothing soundtrack.